WARNING:this information can be wrong. *When a snail gets too big for his house, he throws away his house. He becomes a slug. That is why the goal of a slug is to find a larger house. *small snails do not respond to birds, medium sized snails sometimes react to birds, large snails often react to birds. *Sprinkling salt on the snail causes it to dry out. The body of the snail is eaten by the salt, a yellowish slush remains. These are vitamins, proteins, collagen, elastin, everything that is left of the snail. *In a period of 2 weeks the egg swells up, while it fills with water. Inside, a white spot can be seen after 2 days: the embryo of a new snail. On the white tip, another point can be seen in the days that followed. That is the house in the making. What follows is an unprecedented performance of the small snail. In a gland on his back material is created for the house, which grows with his new occupant. Initially it is no more than a lid, but after a while it starts to take its familiar round form. *Snails are the only molluscs that also live on land. Most snails live in the sea and in addition, some of the species live in fresh water. *Snails consist of 80% water. Their skin consists of only one cell layer, allowing water to enter and exit very quickly. *most snails live for about 2 years. One snail can lay up to 500 eggs. In humid summer weather and in the absence of natural enemies, this can lead to spectacular growth. The eggs are small and white translucent. They are deposited in heaps from 20 to 30. Depending on the temperature of the environment, it takes weeks to months before they come out. *In sunny and / or dry weather they crawl away in order not to dry out. 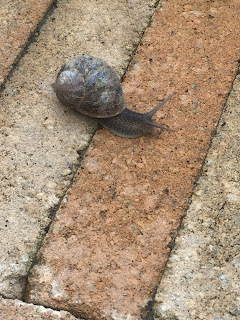 Slugs dig into the ground, snails retire to their snails house and close the opening with hardening mucus. *The first brain cell of a snail indicates that it has found food. The second brain cell then decides whether the snail is hungry, and will also eat the food that has been found. If there is no food nearby, these two brain cells close to save energy and the snail continues with its other brain cells. Love the time-laps in your backyard!! make your own ant farm!